Injectable Body Contouring is used for the enlargement and enhancement of the breasts, calves and buttocks and also for evening out discrepancies in skin surface such as those sometimes caused by liposuction. The first body shaping and volume restoration product which uses hyaluronic acid to achieve this is called Macrolane™ VRF which is no longer indicated for breasts. Treatment involves a small incision in the area and the injection of the substance using a thin cannula or large gauge needle. Due to the fact that the body will metabolise the hyaluronic acid over time, yearly top-ups are required to maintain the optimal results, which should last 12 - 18 months. The quantity required at top-ups may reduce over time. Private costs for injectable body contouring treatment depends on the type and size of the area(s) being treated, such as breast or buttock reshaping and the amount of product required. Typically an initial breast injection treatment will cost in the region of £2,500 - £3,000, with top-up treatment in a year's time in the region of £1,400. Historically, men and women around the globe have submitted to the introduction of all sorts of substances, some more desirable than others, into their bodies in order to achieve an augmentation of areas such as the breasts and buttocks, or to even out discrepancies in the skin’s surface caused by trauma or disease. From early attempts with paraffin and non-medical grade silicone to harvested autologous fat and permanent dermal filler products, the science of adding volume to the body has thankfully come along way. 2008 saw the launch of a new product on the UK market called Macrolane™ VRF which has become the first body shaping and volume restoration product which uses hyaluronic acid, a natural component of our own bodies. It is currently indicated for shaping of the breasts, calves and buttocks and also for evening out discrepancies in skin surface such as those sometimes caused by liposuction. 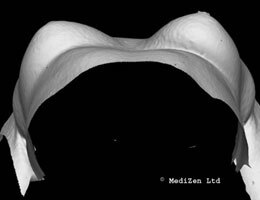 Q-Med has decided to discontinue the breast indication for Macrolane until consensus for best practices in breast radiology examination following Macrolane treatment has been reached. For more information on this, please read their Press Release (PDF) and our Blog. Factual information for practitioners who see patients with Macrolane in the breast area can be found on the Q-Med website. If you are considering Injectable Body Contouring the following information will give you a basic understanding of the procedure. It can't answer all your questions, since a lot depends on the individual patient and the practitioner. Please ask a practitioner about anything you don't understand. What happens during an Injectable Body Contouring treatment? Careful discussions regarding your reasons for wanting treatment are very important before you begin the process. You must also make sure that this treatment can deliver what you want and how you would like to look afterwards. Your practitioner should be able to answer all these questions. This information is describing the use of Macrolane. Treatment, lasting 30 – 45 minutes, involves a small 2-3mm incision in the area, (e.g., normally the crease under each breast or buttock), and the injection of the substance using a thin cannula or large gauge spinal needle deep into the subcutaneous skin layer above the muscle. Due to the fact that the body will metabolise the hyaluronic acid contained within Macrolane over time, yearly top-ups are required to maintain the optimal results. Althought it is noted that potentially over time this top-up may reduce in quantity. It will be some time however before long term data on the average duration for particular indications is properly known. The results are seen immediately and over the following days as any swelling or bruising disappears. Macrolane is intended to last for 12-18 months in the body according to the manufacturers, depending on the area treated and the amount of volume used and will require top-ups. How long will it take to recover from Injectable Body Contouring? You may be required to rest in a room afterwards for an hour or so following treatment, but normal activities can usually be resumed the following day. It is best to avoid vigorous physical activity or sports for one to two weeks after this procedure and a support garment, such as a sports bra or lycra cycling shorts may be worn. What are the risks and potential complications from Injectable Body Contouring treatment? The actual procedure is generally well tolerated, due to the local anaesthesia. You may feel a tugging sensation during treatment as the cannula and substance moves around but you should not feel pain. People may experience mild swelling, bruising or tenderness, which will be uncomfortable for the first first days post treatment but should resolve in approximately a week. Scars from the points through which the substance is injected are very small and will often fade over a period of months - becoming barely noticeable. What should you do after an Injectable Body Contouring treatment? It is very important that you follow the advice of your practitioner carefully after Injectable Body Contouring treatment to help to ensure the success of the procedure and reduce the risk of complications. following a course of antibiotics which may be prescribed both pre and post treatment to reduce any possible risk of infection. avoiding physical activity for a couple of weeks. wearing a support garment such as a sports bra or lycra cycling shorts. contacting your practitioner immediately if you notice any signs of infection or if you experience heavy bleeding or a sudden increase in pain. Who should not have Injectable Body Contouring treatment? Women who have had breast cancer or who have a strong family history of breast cancer may not be suitable for treatment. Who can perform Injectable Body Contouring? Ideally treatment for breast reshaping should be carried out by a qualified cosmetic or plastic surgeon who has experience of traditional breast augmentation procedures and the anatomy involved, as well as having had bespoke training with the product. Currently UK practitioners, both surgeons and cosmetic doctors, have been trained and certified in the use of products like Macrolane for body contouring, with approximately half of those also trained and certified for breast reshaping. Be sure to verify the training credentials of any practitioner offering such treatments. Is Injectable Body Contouring available on the NHS? What is the average cost of Injectable Body Contouring? Private costs for injectable body contouring treatment depends on the type and size of the area(s) being treated, such as breast or buttock reshaping or the correction of skin discrepanies, and the amount of product required. Typically an initial breast shaping treatment using 200ml (100ml for each breast) of Macrolane will cost in the region of £2,500 - £3,000, with top-up treatment in a year's time in the region of £1,400. Although it is noted that the cost of the top-up treatments is likely to decrease because less of the product will be needed over time to maintain the optimum results. Products like Macrolane truly represent new and innovative ideas to the enter the aesthetic marketplace; unlike anything currently available for body reshaping and volume restoration. It requires no general anaesthetic, major surgery or overnight hospital stay and produces significantly less scarring and a more natural outcome, both in terms of visual and palpable body shape and long term metabolisation by the body, which is not achievable with permanent dermal filler products or silicone based implants. Initial patient feedback following the addition of Macrolane to the breast is very positive, with many noting that they are unable to feel anything significantly different in their treated breasts from how their own natural breasts felt; this is particularly noted in those patients where only one breast is treated for asymmetry, giving an immediate split-body comparison. Additionally the free movement of the breast to create a natural cleavage and to fit correctly in underwear is said to be unaffected, areas which are often dramatically altered with the addition of traditional silicone implants. Before (left hand side) and after pictures from different views using the unique VECTRA 3D imaging system in monochrome (to take out skin complexion and highlight shape and contour of asymmetrical breasts before and after treatment with Macrolane). Photographs courtesy of Dr. David Eccleston M.B. Ch.B. B.A.C.D at MediZen Ltd.
Click for ALL Injectable Body Contouring clinics in the UK & Ireland registered and verified by Consulting Room.